This weekend inspiration comes in the form of the crisp and bright colours and patterns of Arctic Frog. 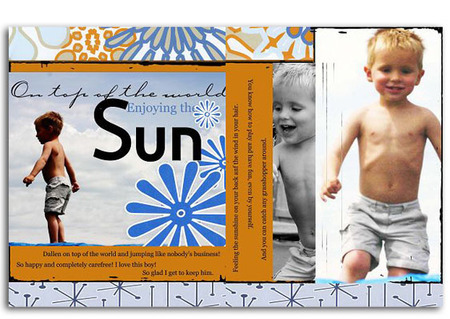 Rachel Axton uses the Premier Blend range of papers by Arctic Frog in this layout. She loved this photo of Megan who was delighted at receiving a pretty dress from Grandma, and it was clear by her expression! Rach wanted to keep the focus on the photo, and the colours in these new soft and pretty Arctic Frog range made that easy to do. When looking for Arctic Frog layouts we were immediately struck by Mindy Bush's layouts, she has a beautiful style, takes stunning photos and has the most amazing eye for matching colours. 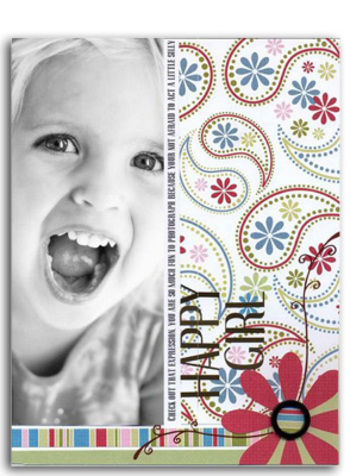 In her layout Happy Girl, the photo is stunning, but the colours used in the new Ski Bunny range sing out girl, joy, happiness and light. We love all the small attention to detail in the right hand bottom corner. Welcome Home Aiden uses the Sunday Brunch range and Mindy has matched the papers with these delicate special photos so well! Sun is just stunning, it contains papers from both By the Sea and Polar Picnic, beautiful photos and really good use of paper and colour. Thank you Mindy for allowing us to share your superb talents here. We were also lucky enough to stumble across this layout from Denine Zielinski. She also uses the new Ski Bunny range, and it is very clever with amazing result. We love the scalloped circle, it is a unique idea and the bright fun colours match the feeling of the layout perfectly! Thanks also for these two layouts to Summer Fullerton. Winter Essentials makes wonderful use of the Ski Bunny range, and we love the way she has echoed the pattern with hand stitching. 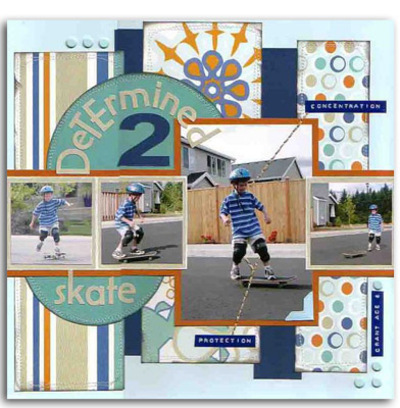 Determined 2 Skate has movement and life and the photos work brilliantly with the By The Sea papers. 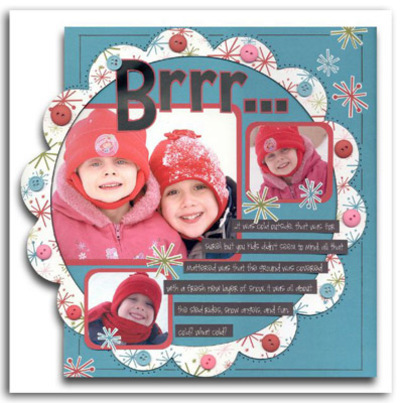 Closer to home our own Melissa Goodsell has created this fabulous layout of her daughter. 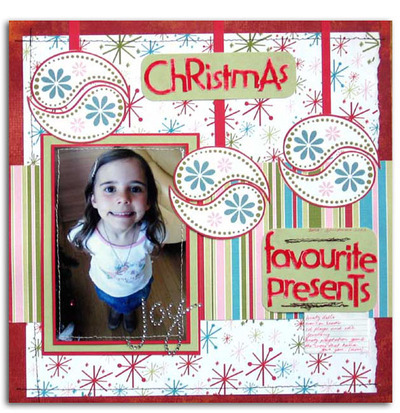 This photo wasn't taken on Christmas Day, but Mel wanted to record Bella's favourite presents that she received for Christmas on a layout, so she selected a random photo and created a Christmas feel to the page with the Artic Frog ski bunny papers. The baubles were hand cut using the Mogul Run Artic Frog patterned paper. And there's more! 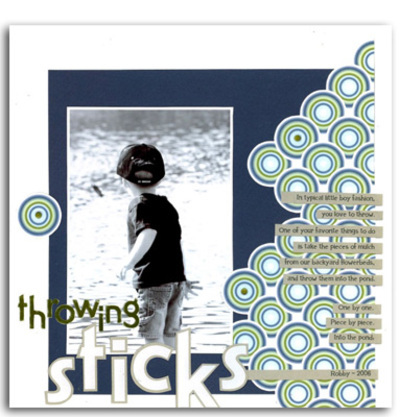 A big thank you to Linda Harrison for sharing her layout "throwing sticks". 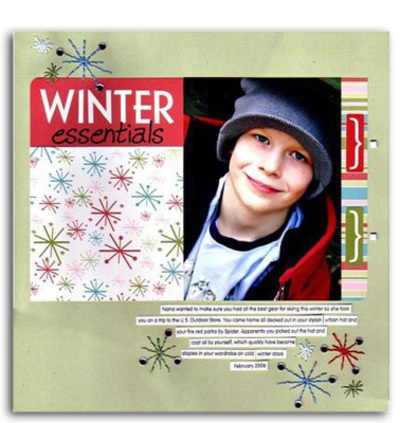 This layout uses the Premiere blend of patterned paper by Artic Frog. It's boyish, fresh and just plain cool! We love the way the cleverly placed circle on the right hand side helps draw attention the photo and balance the layout. 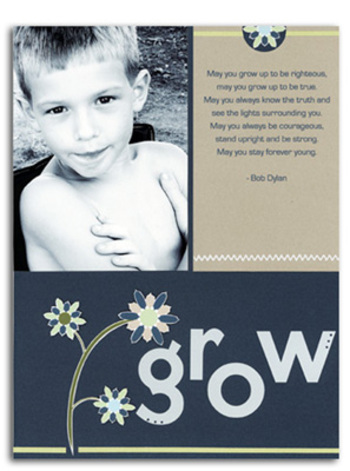 Finally we're thrilled to share "Grow" by Carrie George. We love the simply elegance that this layout has. Carrie has used a selection of plain Artic Frog papers, combined with a splash of handcut flowers from the Studio L fabric patterned paper - also from the Premier blend range.